Automobile Magazine has run a new G37 coupe on the dyno with some great results. The VQ37VHR is an interesting engine. Its the first V-6 in the US to use infinetely variable valve timing and lift. The throttle body is no longer necessary , but still in place they say , because of emissions. The new technology doesn't really mean much to most people , but will open up some tuning challenges when upgrading this car. We will have to see how the system actually works to see what and how things can be upgraded. Even then , if its really necessary to upgrade the camshafts. Its going to add another dimension to trying to tune , and squeeze more power out of these engines. So onto the dyno testing. 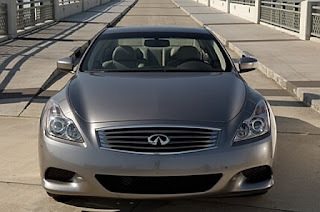 51 more rear wheel horsepower for the 2008 G37 coupe over the 2007 G35 coupe. Thats a lot of power. Thats 5 mph in the quarter mile. It also has about 20 more lb-ft of torque 500 rpms sooner. 287 rwhp @ 7300 rpm , 236 lb-ft @4400 rpms.